The front entrance, with the stunning Civic Hall in the background. The second Wetherspoon’s on the quest, The Cuthbert Brodrick is a go-to of ours when we’re looking for Sunday breakfast or a good variety of real ales (or both!). And unlike its counterpart in the railway station, this pub is decidedly un-claustrophobic, with plenty of seating on the ground floor as well as the mezzanine, plus a vast beer garden. Its location can be a good or bad thing; it offers a great view of Millennium Square and the Civic Hall, but can also get quite crowded, especially when there’s a show on at the O2 Academy just up the hill. The views (and some of the outdoor seating) are also obscured when there’s a stage or market set up in the Square. 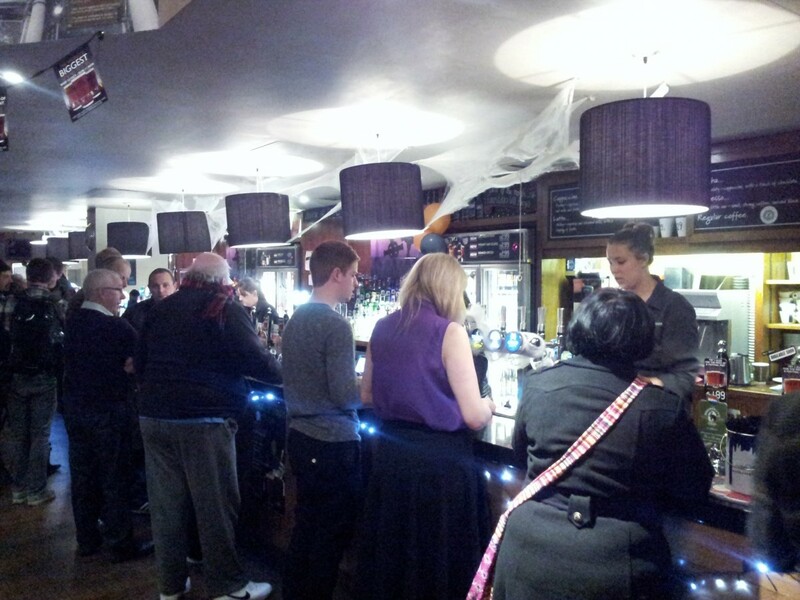 The bar area, on a particularly crowded evening. 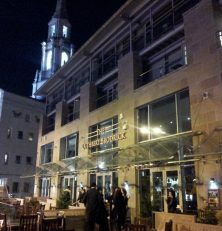 Like any Wetherspoon’s, The Cuthbert Brodrick (named after the architect of Leeds’ beautiful Town Hall) shows a true devotion to quality real ales. Local favourites and exciting guests rotate through the 9 hand pumps, and you never know what you might find on a visit (unless you follow them on Twitter, of course). The prices can’t be beat, with pints in the £2-£2.50 range. 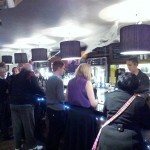 And on the plus side, from the outside it’s not obviously a Wetherspoon’s, which lends it a more local feel. The food is reliably Spoon-like, and service always comes with a smile. The Cuthbert Brodrick offers pretty much everything we’re looking for in a chain pub, which is why we find ourselves here with some frequency. 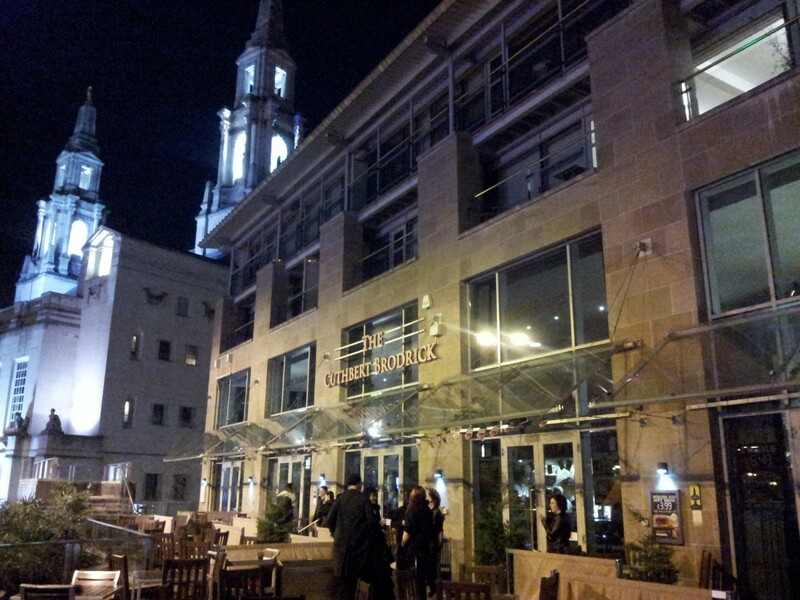 It’s pretty clear that the Cuthbert Brodrick is your favourite Wetherspoon’s pub in Leeds, which is fine. 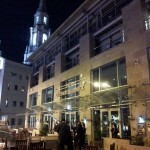 What’s a shame is that you aren’t being particularly impartial when reviewing the other JDW pubs in Leeds. Each one has a link back to this page, which is biased in anyone’s view. “Un-claustrophobic” is not what I’d call the Cuthbert, especially at peak times on an evening after work and when the Sun decides to come out and play. Also, in my experience the ale selection has often been poor when compared to Becketts Bank, The Station and Stick or Twist (the latter recently winning the Leeds CAMRA pub of the season Winter 2012). As for drinks prices, the Stick is the cheapest JDW pub in Leeds (granted not for long due to the arena, but accurate facts please!). I’m not knocking the Cuthbert as a pub, as you will find me there when the Sun is shining on a lunch time, but I think you need to raise the blinkers when reviewing the other JDW pubs in the area. We’re not operating under any pretense of being impartial – these are entirely our views. Which is why we love other people’s reviews in the comments… Thank you for yours! An unexciting crowded boring hole and waste of a good location.